From the architects that brought you Sapphire Tower, East Village presents Element, located on the corners of Market Street and 15th Avenue. 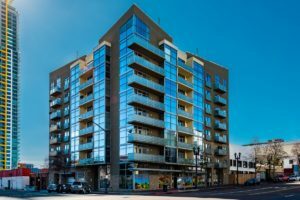 Element is a contemporary and modern designed 8-story mid-rise building of concrete construction which consists of 65 condos and 4,000 square feet of retail space. Developed and completed by Centex Homes in 2006, Element offers five different floor plans of 1 & 2 bedroom units ranging from 550 to 970 square feet. Highlights include stainless steel appliances, granite counter-tops, maple cabinetry, walk-in closets, and private balconies or decks. Features include a landscaped courtyard with waterfall and fountains, community fitness center, and secured underground parking. HOA dues range from $400-$500. Element has been attractive to investors who want to buy a lower priced home in this area hoping the new San Diego Charger Stadium be built only a few blocks away. Element is conveniently located near an Albertson’s Grocery Store, Smart & Final, and popular breakfast/lunch restaurant, The Mission. Just a few blocks away you can catch a ballgame at Petco Park, or stroll into San Diego’s famous Gaslamp Quarter. This complex is also close to the public library and several freeways and Trolley stops, making access to surrounding Downtown Neighborhoods a breeze.